Perfect for the skydiving organizer, this app allows formation skydives to be assembled from a collection of over 1000 skydiving formations, from 2-ways to 20-ways (yes, every size: 2-, 3-, 4-, 5-, 6-, 7-, 8-, 9-, 10-, 11-, 12-, 13-, 14-, 15, 16-, 17-, 18, 19- and 20-ways!). The huge variety of formations includes both easy and challenging formations, making it easy to quickly create dives for jumpers of all experience levels. Need some 7-way or 13-way formations? You'll find plenty in this app. This is the official app based on Mike Truffer's popular book, "The Book of Skydiving Formations", which has helped skydivers plan dives for many years. Note that 50% of the profits from this app go to the U.S. Parachute Team fund. Once a dive size is selected (2-way, 4-way, 20-way, etc. ), formations can be browsed and added to form a sequence of "points", which becomes the planned skydive. The completed dive can then be reviewed while it is practiced on the ground ("dirt-dived"). 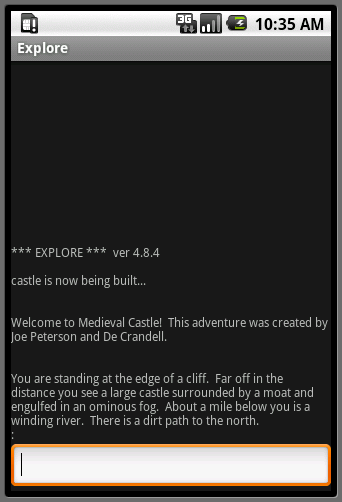 Explore the "Enchanted Cave", the "Lost Mine", and the "Medieval Castle"! Find clues along the way and employ objects you find in order to escape and win! Before 3D graphics were widely available for use in games, there existed a few classic adventure games that relied on words to spark the imagination of the player. When I was a young teenager, I was enthralled by such games as "Adventure" (it takes place in "Colossal Cave"), which was alive with magic at every turn. My cousin, who was also hooked on this game, and I would stay up late into the night inventing our own fictional worlds, and in the process, we created the three adventures included in this app. Through "Explore", you can visit the magical world of the "Enchanted Cave", the "Lost Mine", and the "Medieval Castle". By using simple one or two-word commands, you can walk around, find items that will be useful later, and follow clues to help you escape and win. if you need some help getting started after selecting an adventure, just enter the "help" command. By today's standards, these old "text adventures" may seem quaint, but many people still find them a challenge. And just like when reading a novel, to see, explore, and interact with your surroundings using only your imagination can be quite a cool experience!